The 10th session of the 12th National People's Congress (NPC) was convened in Beijing Monday. An important agenda is reviewing the report on Hong Kong's political reform and making a decision. The session will conclude at the end of this month and the decision will soon be revealed. Central government has set criteria, including that Hong Kong's chief executive must "love the country and love Hong Kong and not confront Beijing. After NPC's decision is released, public opinion predicts extreme opposition groups in Hong Kong will likely launch the Occupy Central movement and students from several universities there may boycott classes. Then the stability of Hong Kong society may face the most unprecedented pressure since Hong Kong returned to China. Nevertheless, we maintain that China must bear all the pressure. Since its return to the motherland in 1997, Hong Kong has been bothered by the legacy of the colonial era, as well as a myriad of ideological clashes brought about by globalization. 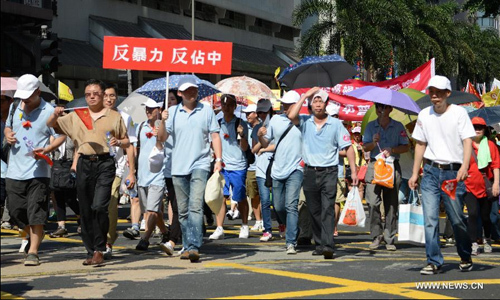 Struggle has not ceased in Hong Kong during the past more than 10 years. Therefore, the contest around political reform this time seems like a showdown between the opposition camp and the central government. And Hong Kong's political status in the future will probably be decided by the result of this round of contention. We need to objectively analyze the balance of power between the two sides and anticipate the worst scenario. Both the Occupy Central and class boycott may happen, damaging Hong Kong's normal operations to a certain degree. At first Beijing and the Hong Kong SAR government will reduce losses and limit negative influence to the best of their ability. If these activities pose a shocking threat to Hong Kong or continue unabated, enormously dampening the city's functions, it is imperative that the Hong Kong government adopt coercive measures. And the worst situation will occur when opposition groups call for sharper confrontation and the West interferes more with Hong Kong's affairs. Will China be able to afford all these? We think so. And what is more important is that even the worst situation is much better than a constitutional crisis with the rise of a chief executive confronting Beijing that will later be compelled to outlaw him. The opposition camp in Hong Kong embraces some unrealistic illusions that must be knocked out. A number of extremists must pay for their illegal confrontational behavior, which should serve as the basic logic for Hong Kong society. It now seems that consolidating Hong Kong's return comes with a price. Beijing should remain calm. As long as we do not allow Hong Kong to fall into the Western sphere of influence, the Chinese mainland and Hong Kong will have inexhaustible resources to make extreme opposition groups and their supporting forces desperate.